Half way into the lunch, Giuseppe Palmieri is doing the unimaginable. He has brought three bottles to the table — a German Riesling, a French Chenin and an Italian Malvasia. “You see-this wine is too young, this one is too ‘hard’ and this one is too aromatic,” Palmieri says before he starts to cuvee the three in front of me. 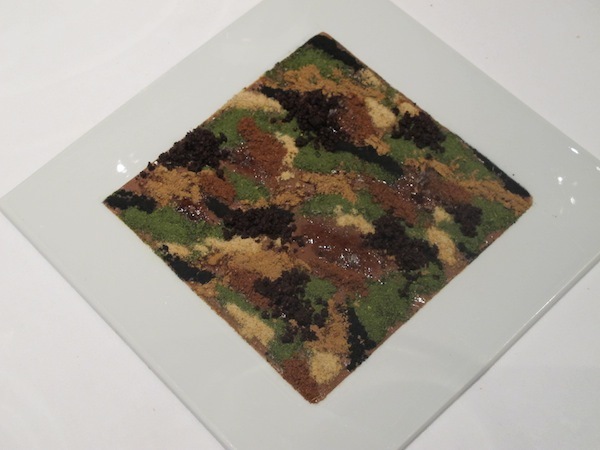 The result is as good as the idea itself is ‘scandalous.’ The cuvee is paired with Camouflage or Hare in the Woods, a dish of jugged hare liver and 14 other ingredients in form of powder that resembles an abstract painting. 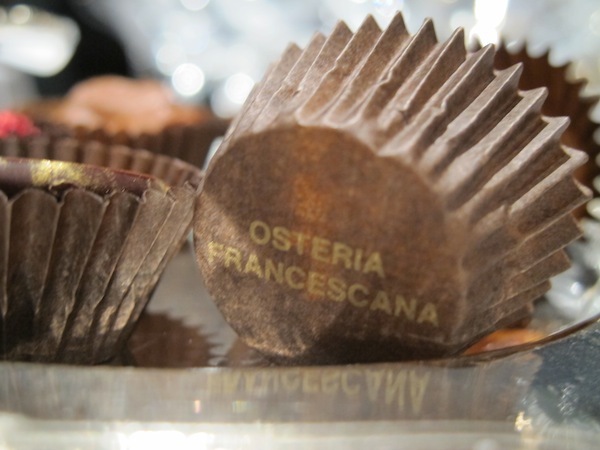 It is just another ordinary day at Osteria Francescana. 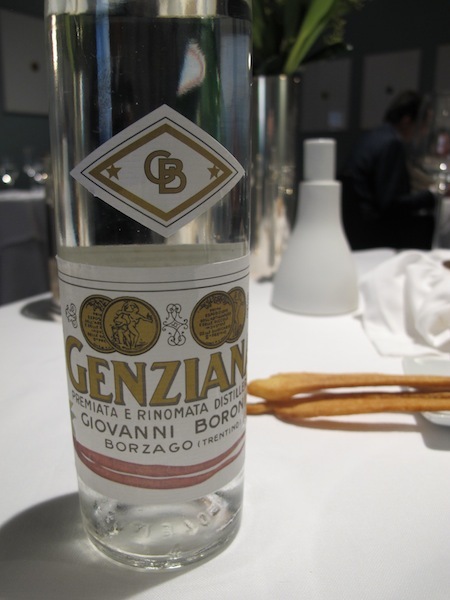 The Modenese restaurant is an institution. It has received all accolades imaginable — three Michelin stars, top five rating in The World’s 50 Best Restaurants list, best Italian restaurant according to Guida L’Espresso, as well as huge international following for chef Massimo Bottura and his team. For the restaurant to stay on top, experimenting with new aromas, and taking risks along the way, is a must. 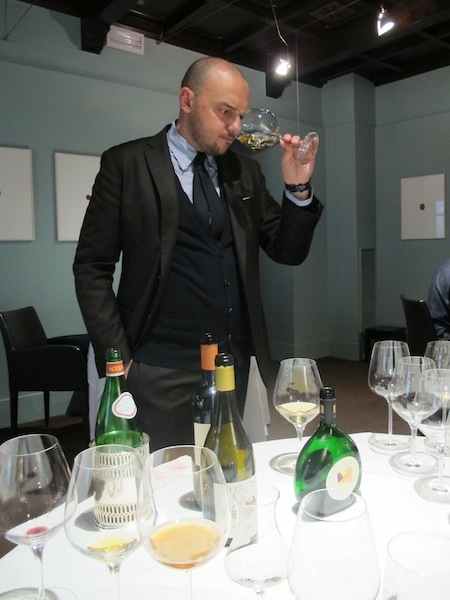 On paper, 37-year old Palmieri is Francescana’s sommelier (and restaurant manager). In real life, his task is to be as avant-gardeas Francescana’s philosophy of creating modern dishes rooted in traditional Italian cooking. This is no easy task, considering chef Bottura’s creative reinterpretation of classics such as bollito misto or pasta fagioli. “When you have to pair the wines with a tasting menu of a big chef, you have to take one step back. Otherwise, you risk destroying his ideas. You’ve done a great job if you’ve taken one step back and chosen something that will complete the experience,” Palmieri insists. More than just completing the experience, it came to my mind that Bottura and Palmieri have joined forces to provide guests with a glimpse into the future of gastronomy. Palmieri’s ideas are by no means public, at least for now. They are more of a work in progress and a display of what the next step in pairing wine and food could be. Being one of the world’s leading restaurants, Osteria Francescana needs to be miles ahead of everyone in discovery, research and the development of new aromas. As I slowly digest Palmieri’s words, and kitchen-Francescana’s creations, it occurs to me that his avant-garde stands easily shoulder to shoulder with that of Italian artisanal organic winemakers, such as Arianna Occhipinti of Sicily, Gabrio Bini of Pantelleria or Podversic himself. Occhipinti’s words from our interview earlier this year — of Italy coming back to its roots and replanting traditional grape varieties — echo in my ear. It comes down as a sort of an evolution of tradition when wines of up until recently unknown grapes, such as Ribolla, Frappato, or Zibibbo, are finding its way back to Italian wine lists (they make up a significant proportion of Francescana’s wine list). This is by no means an easy task, considering that even in Italy organic wine lists are rare and still mostly populated by mass-production wine estates, especially Tuscan ones. 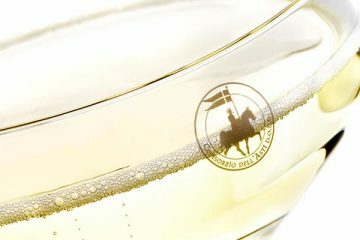 “To change the approach to wine, you have to give a different point of view of the evolution of tradition. Wine is a category that is not definite. 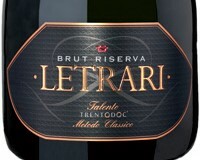 For example, we should not consider today’s Chianti Classico as definite because we are now witnessing its evolution! This is the hardest part for people like Occhipinti because she and her colleagues live dreams and take risks everyday,” Palmieri says. 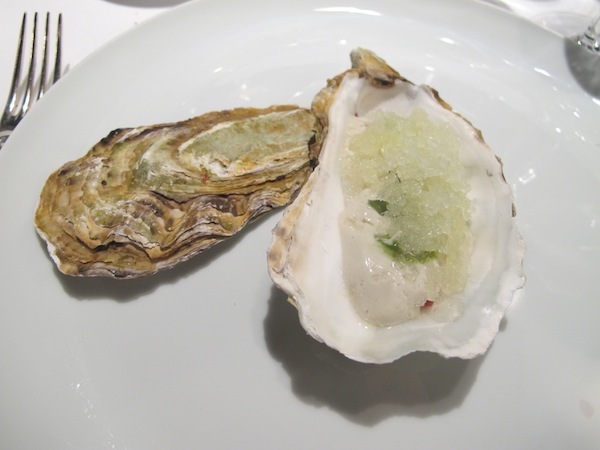 Marko, That is a well written piece and describes perfectly the overwhelming experience an evening at Osteria Francescana turns out to be. I also had the pleasure of being spoilt by this magician of the wine-world and his strange brews. What an incredible and enjoyable expperience. Anti orthodox but very effective and perfectly matching. I could sing, Last night a VJ (Vine Jockey) saved my life. He said, ‘There aint nothing I cant fix, Cause I can do it in the mix’ Superb. Eeel with Chestnut Beer, lamb, oyster water, green apple granita and seaweed — with a cuvee of water and Genziana herb grappa; and his own perect Cuvee from 3 different wines with the ‘Hare in the Woods’ Cant wit to return and rediscover the future of food and drinks with Massimo and Palmieri. You Marko keep up the good work. Enjoyed this one thoroughly.